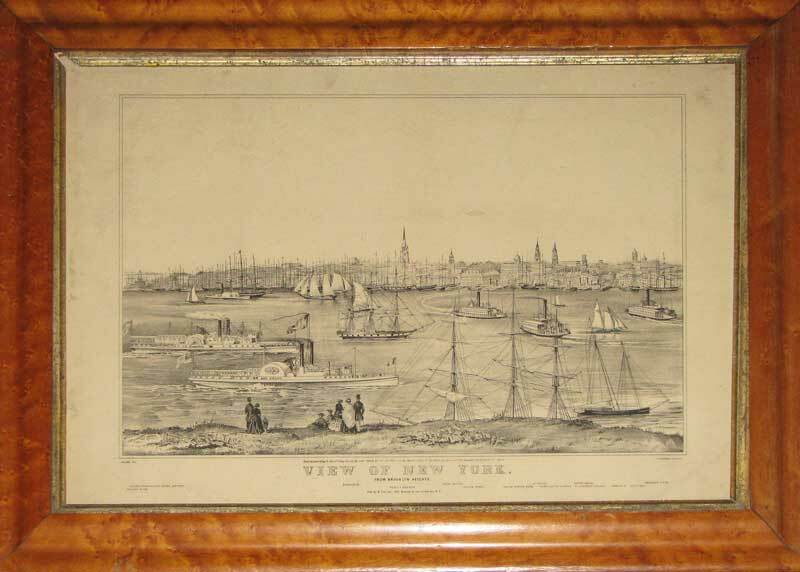 A lithographic image of mid Nineteenth century New York by Nathaniel Currier after the sketch by Mr. Palmer; published in New York in 1849. This early view of Manhattan from the south-east shows all manner of shipping on the Hudson River in the foreground with various landmark buildings identified in the key below. The artist has pitched himself on Brooklyn Heights so is facing the tower of Trinity Church across the water (now dwarfed by the skyscrapers of Broadway and Wall Street). To the left is the Exchange Building and to the right we can see the tower of the original New York Post Office. Also mentioned are various hotels and the City Hall. It is fascinating to see the Fulton Ferry that was founded in 1830 and still takes passengers to and fro between Brooklyn and Manhattan.